When Mr Taiwo walked dejectedly into The Synagogue, Church of All Nations in Lagos, Nigeria on Sunday 30th August, unbeknown to him was the unfolding of a divine design to break the chains of poverty and restore the bonds of unity within his crises-fraught family. The prophecy took him by surprise. It was so sudden, so direct, so precise. 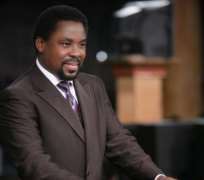 Pastor TB Joshua narrated his life to him, a brief 30 seconds of breath-taking revelation, a concise uncovering. As he was led through the beautiful sanctuary, a flame of hope licked within his veins. Could it be a way out had actually come? The following week he stood again before the vast SCOAN auditorium, clips of his 'home' broadcast to the world live on Emmanuel TV. Evangelists had accompanied Taiwo to establish the veracity of the prophecy. The crowd gasped, beholding a dank wasteland with pigs scavenging among the filth, dirty infected water up to the knees, slime and grime at every turn. And a human being lived there, slept there, ate there, amidst the clutter and litter of decomposing garbage and gunk. “I'm useless,” the former furniture maker told the evangelists. “I just have to go and hide myself here when it is night. This is a shameful place, but I have no alternative – that's why I have to stay here, living here as a mad man,” he said, explaining how local hoodlums had burnt his only property to ashes, forcing homelessness upon him. Tears of shock and joy escaped from beneficiaries and congregants alike. Never before had Kefa seen or touched such money. “I didn't expect this. Thank you, sir,” he quibbled, words failing to form his heart-felt expressions of gratitude. “This is what we are born for, this is what we are to live for, this is what we are to die for,” smiled the prophet, ascribing all glory to God.